I always enjoy seeing John demonstrating and as it's three years since he has been to SWC I was looking forward to seeing what he had to show us for a full day event. The theme for the day was thread chasing with each of the items he turned including a thread. John told us that every time you turn a box with a threaded lid you have to turn three threads – one on the bottom, one on the lid and a third one to screw the top onto to finish it. He generally uses a 16tpi thread chaser to turn his threads and his favourite woods for thread turning are boxwood, blackwood and Mopani. To turn a right handed thread you push the thread chaser from right to left and to turn a left handed thread you pull it from left to right, however you still start from the outer edge. Left handed threads are only used occasionally e.g. when making a puzzle box. The point tool is one of John’s favourite and most frequently used tools. He explained that it is a one handed tool that has a point which you use for cutting – to do this you must raise the handle slightly above the centre. It can also be used for planning; for this you point the tool upwards with the point slightly above the work and plane your work with the edge of the tool. To demonstrate how it works he turned a backgammon/draughts piece, pulling the tool towards himself with the handle slightly raised to plane the piece and using the point to turn a pattern in the surface. John started with an olive log measuring approx. 4" long by 1½" diameter which had a spigot already turned at each end. He mounted this in the chuck and parted it off in the middle then, using a short gouge with a double bevel, he turned a curve on the end of the piece left in the chuck. After marking the centre he drilled to the required depth, using a hand held drill and started to hollow it out with a spindle gouge. He finished it with a round scraper then sanded it with foam backed abrasives held in locking forceps. To finish, he applied wax with wire wool held in the forceps. (See photos JB11_01 and 02). After ensuring he had a straight edge inside the neck he set the lathe speed to 450rpm and started turning a thread using an Ashley Isles unichaser supported on an Ashley Isles 'armrest'. To start the thread he held the thread chaser at 45 degrees to the work and, starting with the second tooth on the chaser, he made 2-3 passes across the piece to establish the beginning of the thread. He continued chasing the thread, gradually moving the tool handle towards the middle and finished with a slightly tapered thread. (See photo JB11_03). He used a 1/4" point tool to finish the top edge of the box then sanded through the grits, working from 180 to 1,200. To finish it he used paper to apply melamine lacquer, with the lathe stationery, then buffed it with the lathe running and applied wax to the thread. (See photo JB11_04). To finish the outside of this piece he took it off the lathe and mounted the other end of the log in the chuck. He would then use this to finish the bottom and turn the lid. First he turned a spigot to fit inside the box then turned a recess at the back of this spigot and a chamfer on the front. He turned away a little of the timber behind the spigot then started turning the thread with the chaser turned the other way round (i.e flipped over by 180 degrees). With the chaser held at 45 degrees to the work he turned a thread as before, continuing until the box screwed onto it easily, right the way up to the shoulder. With the box screwed onto this thread he brought the tailstock up to the work and turned a small foot on the bottom which he finished with the point tool, tapering it slightly into the box. He turned a small, demarcation, groove above the foot then finished shaping the box. Finally he removed the tailstock, turned a couple of rings on the foot with the point tool then sanded it, blending it onto the top half, and finished it as before. (See photos JB11_05 and 06). John mounted a boxwood log measuring approx 4” by 2¼” between centres and turned it to a cylinder. He tidied up the ends and turned a spigot on each end. He mounted one end in the chuck then parted off the lid ½" from the chuck. After marking a diameter of 2” he turned it down to this size and hollowed the inside, leaving straight edges for the thread. After turning a recess on the inside, behind where the thread would go, he used a 14tpi chaser to turn a female thread then waxed it, trued up the front edge and removed it from the lathe. (See photos JB11_11 to 13). Next John mounted the remainder of the log on the chuck and turned the first 2-3 inches to a 2” diameter. He then cut a spigot on the end, the same length as the thread in the lid and the correct diameter to fit inside the lid. He cut a recess behind this then turned a male thread. When he tried to fit the lid to it he found it was a bit tight so he turned away the surface of the thread then cut it again. Once he was happy with the fit he screwed the lid onto it then turned the whole thing to 1¾” long and marked the bottom of it. He turned the sides so they were straight then used the point tool to turn some detail where the lid met the box. (See photo JB11_14). With the lid still attached he turned away the timber in the centre of the lid so he ended up with a ring then, with the lid removed, he marked the centre of the box and drilled down the length of it. He hollowed it out to about half of its diameter, using a square ended box scraper then turned a recess inside, chamfered the end and waxed the chamfer and thread. He parted it off ½” past the mark he made earlier then hollowed the timber left in the chuck and turned a thread in this to fit the box into. He screwed the box onto this sacrificial timber then marked the centre and drilled a hole through it to meet the one he had drilled from the other end. He used a square ended box scraper to turn this hole to ½” diameter then brought the tail stock up to the work to steady it and turned away the timber on the outside as far as the line he marked earlier. He turned to a cone shape , ½” long, then sanded and finished with wax. (See photo JB11_15). For this project John used three main tools, each with a negative rake (i.e. the handle is uppermost) – a square tool, combination tool and point tool. 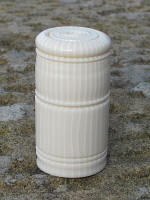 He mounted a 1½” diameter cylinder of alternative ivory in the chuck – this is actually made from cast polyester. He trued it up and turned a small spigot which would eventually become the foot. Using a thin parting tool he parted it off ¼” from the chuck to make the lid. He hollowed it, using the square tool and turned a little bit of pattern on the inside. Using a recess tool he turned a recess at the back then turned a female thread and finished the bottom of the lid. He polished the inside thread with T-Cut, taking care to avoid the thread then applied wax to the thread. The wax on the thread acts as a lubricant and stops it squeaking when you screw the two pieces together. (See photos JB11_16 to 19). To turn the outside of the lid he mounted the remaining piece of ‘ivory’ in the chuck, marked the centre then drilled a hole to the desired depth of the finished box. He removed a small amount of material from the centre then turned a spigot to fit the lid and turned a male thread on it which he adjusted until the lid fitted onto it. With the lid screwed onto this he trued the end with the square tool then turned a pattern in the end, turned a bead on the edge then turned the side of the lid, making another small bead where the lid meets the base. He sanded this, starting at 240 grit and taking care to ensure he didn’t soften any crisp detail. (See photos JB11_20 and 21). To finish the lid John used a rotary chisel mounted in a Dremel type tool to carve notches all the way round the outside of the lid. He did this freehand whilst holding the lid in his hand, then polished it with T-Cut. He also carved a pattern on the top of the lid using a 6” nail that was serrated round the head and held in the chuck. Holding the lid in his hand, he brought it up to the nail and carved the pattern. Finally he mounted the bottom of the box back on the lathe, screwed the lid onto it and applied gilt cream to all the carved areas and the notches round the edge, then he turned the lathe on and buffed it with paper. (See photos JB11_22 to 24 below - click the picture). Now to the bottom of the box. Using the combination tool he turned the outside of the box, adjusting the height of the handle to control the cut. He turned the top of it to mirror the bottom of the lid, then curved the rest of it down towards the base. He hollowed the inside with the square tool and a round ended scraper, following the shape of the outside and turning a curve in the bottom. After sanding the inside he finished it with T-Cut. To finish the underneath he removed it from the chuck, mounted it onto a piece of sacrificial timber and held it in place on the lathe with the tailstock. He turned the spigot to a foot then removed the tailstock and turned three coves in the base, making it slightly concave. After sanding it he finished it with T-Cut. (See photos JB11_25 to 31). To make this project John mounted a log of boxwood approx. 3” long by 2” diameter between centres, trued the end and turned a spigot. Using this spigot he mounted it in the jaws, held in place with the tailstock, and tidied the outside of it. He then trued the end and turned another spigot. Next he parted it off approx ½” to ¾” from the headstock and turned the chuck to a lid. First he hollowed out the inside, leaving the sides straight, then he turned a pattern on the inside and made a recess at the end of the wall. After waxing the inner surface he turned a female thread on the inside edge. To finish it he shaped the end with a point tool and turned a pattern on the outer edge. After waxing the thread he removed it from the lathe. (See photos JB11_32 and 33). John mounted the other part of the log in the chuck, turned a spigot at the end to fit inside the lid then turned the area behind this to the same diameter. He turned a long thread on the outside edge, making sure it was a good fit with the lid. With the lid attached he used a parting tool to mark it just under the lid, then removed the lid and hollowed it to just a bit deeper than the parting tool mark. He turned a lip on the inside then waxed it and parted it off. (See photos JB11_34 and 35). His next task was to extend the remaining thread and adjust it until if fitted the lid. After first marking where it fitted in the chuck he removed this from the lathe and remounted the lid in the chuck. He screwed the ring he had made earlier into the lid and used the point tool to turn the end and disguise the join between the two pieces. After checking that he could remove the inner ring he sanded and waxed it. (See photo JB11_36). To finish the lid he remounted the main piece of wood back onto the lathe and screwed the lid (without the ring) onto it. He turned some rings and beads on the end and on the edge of the lid then sanded and waxed it. (See photo JB11_37). Now John turned his attention to the bottom of the box. He marked the end with the maximum diameter he needed for the outside of the box then he turned it down to this diameter. Then he measured the inner diameter of the ring with Vernier calipers and turned the next couple of inches, all but the first ?”, to that size. As before, he marked the centre then drilled and hollowed it to the desired depth. He shaped the inner edge of the top then sanded and finished it and parted it off. To finish the box he mounted a small cylinder of timber in the chuck and turned it to a jam chuck to fit inside the box. With the box mounted and centred on this he made sure the ring would slide onto it then tidied the edge and the base and turned some decoration on them. He also ensured that the narrow piece he had left at the top of the box earlier was slightly smaller than the outer diameter of the ring. Finally he sanded and waxed it then removed it from the jam chuck and assembled it. He slid the ring up from the bottom then screwed the top onto it. The trick with this box is that the lid will only unscrew if you hold the ring in place with your fingertips. (See photos JB11_38 to 40). Casein is an early or primitive form of plastic, made by extracting protein from milk. John mounted a piece of casein 2” long by 9/10” diameter in the chuck then parted it off ¼” from the jaws. He drilled and hollowed the inside of this then turned a thread on the inside of it and removed it from the chuck. Next he put the other end in the chuck and turned a spigot to fit the thread in the lid. He drilled and hollowed it then turned a thread on the spigot. With the lid screwed onto it he turned the outside, turning a pattern where the two parts met and at the top edge, curving the edge and putting a pattern on the top. After sanding the lid and finishing it with T-Cut he took the base out of the chuck and mounted a piece of waste timber in the jaws. He turned a thread on this to fit the thread he had chased on the box and screwed the base onto this to finish it. He tidied the end and the sides then turned a foot and some pattern to match that on the lid. Finally he sanded it and finished it with T-Cut. (See photos JB11_41 to 45). This was a very enjoyable day with some interesting projects that, with the right tools and some training in thread chasing, I would be interested in having a go at. John is a very articulate and thorough demonstrator who is always a pleasure to watch. With the exception of the barometer cistern John donated all the pieces he turned to the club for us to sell in aid of our current charity.